For other uses, see Wisdom (disambiguation). 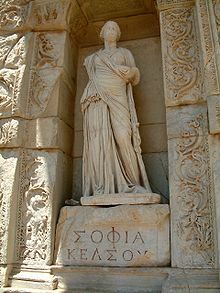 Personification of wisdom (inGreek, Σοφ?α or Sophia) at the Celsus Library in Ephesus, Turkey. Wisdom is the ability to think and act using knowledge,experience, understanding, common sense, and insight.Wisdom has been regarded as one of four cardinal virtues; and as a virtue, it is a habit or disposition to perform the action with the highest degree of adequacy under any given circumstance. This implies a possession of knowledge or the seeking thereof in order to apply it to the given circumstance. This involves an understanding of people, things, events, situations, and the willingness as well as the ability to apply perception, judgement, and action in keeping with the understanding of what is the optimal course of action. It often requires control of one's emotional reactions (the "passions") so that the universal principle of reason prevails to determine one's action. In short, wisdom is a disposition to find the truth coupled with an optimum judgement as to what actions should be taken in order to deliver the correct outcome. A basic definition of wisdom is the judicious application of knowledge. The opposite of wisdom is folly. Synonyms include prudence, sagacity, discernment, or insight. The ancient Greeks considered wisdom to be an important virtue, personified as the goddessesMetis and Athena. Athena is said to have sprung from the head of Zeus. She was portrayed as strong, fair, merciful, and chaste. To Socrates and Plato, philosophy was literally the love of Wisdom (philo-sophia). This permeates Plato's dialogues, especially The Republic, in which the leaders of his proposed utopia are to be philosopher kings, rulers who understand the Form of the Good and possess the courage to act accordingly. Aristotle, in his Metaphysics, defined wisdom as the understanding of causes, i.e. knowing why things are a certain way, which is deeper than merely knowing that things are a certain way. The ancient Romans also valued wisdom. It was personified in Minerva, or Pallas. She also represents skillful knowledge and the virtues, especially chastity. Her symbol was the owl which is still a popular representation of wisdom, because it can see in darkness. She was said to be born from Jupiter's forehead. Wisdom is also important within Christianity. Jesus emphasized it. Paul the Apostle, in hisfirst epistle to the Corinthians, argued that there is both secular and divine wisdom, urging Christians to pursue the latter. Prudence, which is intimately related to wisdom, became one of the four cardinal virtues of Catholicism. The Christian philosopher Thomas Aquinas considered wisdom to be the "father" (i.e. the cause, measure, and form) of all virtues. In the Inuit tradition, developing wisdom was one of the aims of teaching. An Inuit Elder said that a person became wise when they could see what needed to be done and do it successfully without being told what to do. Public schools in the US have an approach to character education. Eighteenth century philosophers such asBenjamin Franklin, referred to this as training wisdom and virtue. Traditionally, schools share the responsibility to build character and wisdom along with parents and the community. Nicholas Maxwell, a contemporary philosopher in the United Kingdom, advocates that academia ought to alter its focus from the acquisition of knowledge to seeking and promoting wisdom, which he defines as the capacity to realize what is of value in life, for oneself and others. He teaches that new knowledge and technological know-howincrease our power to act which, without wisdom, may cause human suffering and death as well as human benefit. Wisdom is the application of knowledge to attain a positive goal by receiving instruction in governing oneself. Psychologists have gathered data on commonly held beliefs or folk theories about wisdom. These analyses indicate that although "there is an overlap of the implicit theory of wisdom with intelligence, perceptiveness, spirituality and shrewdness, it is evident that wisdom is a distinct term and not a composite of other terms. "Many, but not all, studies find that adults' self-ratings of perspective/wisdom do not depend on age. This stands in contrast to the popular notion that wisdom increases with age, supported by a recent study showing that regardless of their education, IQ or gender, older adults possess superior reasoning about societal and interpersonal conflicts. In many cultures the name for third molars, which are the last teeth to grow, is etymologically linked with wisdom, e.g., as in the English wisdom tooth. In 2009, a study reviewed which brain processes might be related to wisdom. Researchers in the field of positive psychology have defined wisdom as the coordination of "knowledge and experience" and "its deliberate use to improve well being." With this definition, wisdom can supposedly be measured using the following criteria. A wise person has self-knowledge. A wise person seems sincere and direct with others. Others ask wise people for advice. A wise person's actions are consistent with his/her ethical beliefs. Measurement instruments that use these criteria have acceptable to good internal consistencyand low to moderate test-retest reliability (r in the range of 0.35 to 0.67). John Vervaeke has argued for a cognitive science of wisdom and argues that basic relevance realization processes that underlie cognition, when fed back onto themselves and made self-referential lead to the enhanced insight abilities we associated with wisdom. "Sapience" redirects here. It is not to be confused with Sentience. For Sapience the software product, see Sapience Analytics. Sapience is often defined as wisdom, or the ability of an organism or entity to act with appropriatejudgement, a mental faculty which is a component of intelligence or alternatively may be considered an additional faculty, apart from intelligence, with its own properties. Robert Sternberg has segregated the capacity for judgement from the general qualifiers for intelligence, which is closer to cognizant aptitude than to wisdom. Displaying sound judgement in a complex, dynamic environment is a hallmark of wisdom. The word sapience is derived from the Latin sapientia, meaning "wisdom". Related to this word is the Latin verb sapere, meaning "to taste, to be wise, to know"; the present participle ofsapere forms part of Homo sapiens, the Latin binomial nomenclature created by Carolus Linnaeus to describe the human species. Linnaeus had originally given humans the species name of diurnus, meaning man of the day. But he later decided that the dominating feature of humans was wisdom, hence application of the name sapiens. His chosen biological name was intended to emphasize man's uniqueness and separation from the rest of the animal kingdom. In fantasy fiction and science fiction, sapience often describes an essential human property that bestows "personhood" onto a non-human. It indicates that a computer, alien, mythical creature or other object will be treated as a completely human character, with similar rights, capabilities and desires as any human character. The words "sentience", "self-awareness" and "consciousness" are used in similar ways in science fiction. Some religions have specific teachings relating to wisdom. Sia represents the personification of wisdom or the god of wisdom in Ancient Egyptian Mythology. Wisdom and the acquiring of it is mentioned frequently in the Bahá'í scriptures. According to the scriptures "The essence of wisdom is the fear of God, the dread of His scourge and punishment, and the apprehension of His justice and decree." Wisdom is seen as a light, that casts away darkness, and "its dictates must be observed under all circumstances", other concepts associated with wisdom and being wise are considering "the regard of place and the utterance of discourse according to measure and state" and not believing or accepting what other people say so easily. One may obtain knowledge and wisdom through God, his Word, and his Divine Manifestationand the source of all learning is the knowledge of God. He who arbitrates a case by force does not thereby become just (established in Dhamma). But the wise man is he who carefully discriminates between right and wrong. He who leads others by nonviolence, righteously and equitably, is indeed a guardian of justice, wise and righteous. One is not wise merely because he talks much. But he who is calm, free from hatred and fear, is verily called a wise man. By quietude alone one does not become a sage (muni) if he is foolish and ignorant. But he who, as if holding a pair of scales, takes the good and shuns the evil, is a wise man; he is indeed a muni by that very reason. He who understands both good and evil as they really are, is called a true sage. To recover the original supreme wisdom of self-nature covered by the self-imposed three dusty poisons (greed, anger, ignorance) Buddha taught to his students the threefold training by turning greed into generosity and discipline, anger into kindness and meditation, ignorance into wisdom. As the Sixth Patriarch of Chán Buddhism, Huineng, said in his Platform Sutra,"Mind without dispute is self-nature discipline, mind without disturbance is self-nature meditation, mind without ignorance is self-nature wisdom." In Christian theology, "wisdom" (Hebrew: chokhmah, Greek: Sophia, Latin: Sapientia) describes an aspect of God, or the theological concept regarding the wisdom of God. There is an oppositional element in Christian thought between secular wisdom and Godly wisdom. The apostle Paul states that worldly wisdom thinks the claims of Christ to be foolishness. However, to those who are "on the path to salvation" Christ represents the wisdom of God. (1Corinthians 1:17–31) Also, Wisdom is one of the seven gifts of the Holy Spirit according to Anglican, Catholic, and Lutheran belief. 1Corinthians 12:8–10 gives an alternate list of nine virtues, among which wisdom is one. According to Confucius, wisdom can be learned by three methods: reflection (the noblest),imitation (the easiest) and experience (the bitterest). Wisdom is not told by self but unless asked for by another. This means a wise man never tells his wisdom unless asked person to person. According to "Doctrine of the Mean," Confucius also said, "Love of learning is akin to wisdom. To practice with vigor is akin to humanity. To know to be shameful is akin to courage (zhi, ren, yi.. three of Mengzi's sprouts of virtue)." Compare this with the beginning of the Confucian classic "Great Learning" which begins with "The Way of learning to be great consists in manifesting the clear character, loving the people, and abiding in the highest good" one can clearly see the correlation with the Roman virtue prudence especially if one transliterates clear character as clear conscience. (from Chan's Sources of Chinese Philosophy). Wisdom in Hinduism is considered a state of mind and soul where a person achieves liberation. The God of intellect (wisdom) is Ganesha and the goddess of knowledge isSaraswati. "O Lord Lead me from the unreal to the real. May there be peace, peace, and perfect peace". Wisdom in Hinduism is knowing oneself as the truth, basis for the entire Creation, i.e., ofShristi. [clarification needed] In other words, wisdom simply means a person with Self-awareness as the one who witnesses the entire creation in all its facets and forms. Further it means realization that an individual through right conduct and right living over an unspecified period comes to realize their true relationship with the creation and the Paramatma who rules it. "He gives wisdom to whom He wills, and whoever has been given wisdom has certainly been given much good. And none will remember except those of understanding." "Say: "Come, I will rehearse what Allah (God) hath (really) prohibited you from": Join not anything as equal with Him; be good to your parents; kill not your children on a plea of want;? We provide sustenance for you and for them;? come not nigh to shameful deeds, whether open or secret; take not life, which Allah hath made sacred, except by way of justice and law: thus doth He command you, that ye may learn wisdom"
The word wisdom (???) is mentioned 222 times in the Hebrew Bible. It was regarded as one of the highest virtues among the Israelites along with kindness (???) and justice (???). Both the books of Proverbs and Psalms urge readers to obtain and to increase in wisdom. In the Hebrew Bible, wisdom is represented by Solomon, who asks God for wisdom in2 Chronicles 1:10. Much of the Book of Proverbs, a book of wise sayings, is attributed to Solomon. In Proverbs 9:10 the fear of YHWH is called the beginning of wisdom. InProverbs 1:20 there is also reference to wisdom personified in female form, "Wisdom calls aloud in the streets, she raises her voice in the marketplaces." In Proverbs 8:22–31 this personified wisdom is described as being present with God before creation began and even taking part in creation itself. The Talmud teaches that a wise person is a person who can foresee the future. Nolad is the Hebrew word for "future," but also the Hebrew word for birth, so one rabbinic interpretation of the teaching is that a wise person is one who can foresee the consequences of his/her choices (i.e. can "see the future" that he/she "gives birth" to). In Taoism, wisdom is construed as adherence to the Three Treasures (Taoism): charity, simplicity, and humility. In Mesopotamian religion and mythology, Enki, also known as Ea, was the God of wisdom and intelligence. Wisdom was achieved by restoring balance. In Norse mythology, the god Odin is especially known for his wisdom, often acquired through various hardships and ordeals involving pain and self-sacrifice. In one instance he plucked out an eye and offered it to Mímir, guardian of the well of knowledge and wisdom, in return for a drink from the well. In another famous account, Odin hanged himself for nine nights from Yggdrasil, the World Tree that unites all the realms of existence, suffering from hunger and thirst and finally wounding himself with a spear until he gained the knowledge of runes for use in casting powerfulmagic. He was also able to acquire the mead of poetry from the giants, a drink of which could grant the power of a scholar or poet, for the benefit of gods and mortals alike. Jump up^ "wisdom." Collins English Dictionary - Complete & Unabridged 10th Edition. HarperCollins Publishers. 28 Feb. 2014. <Dictionary.com http://dictionary.reference.com/browse/wisdom>. Jump up^ Turnbill, S (2011, 12 8). "Athena, Greek goddess of wisdom and craftsmanship". Goddessgift.com. Jump up^ But note that two thousand years after Aristotle, Isaac Newton was forced to admit that "I have not yet been able to discover the cause of these properties of gravity"
Jump up^ "Myths about Roman goddess minerva. (n.d.)". Roman-colosseum.info. Jump up^ "Matthew 11:19 (KJV): "The Son of man came eating and drinking, and they say, Behold a man gluttonous, and a winebibber, a friend of publicans and sinners. But wisdom is justified of her children". Bible.cc. Jump up^ "Matthew 10:16 (KJV): "Behold, I send you forth as sheep in the midst of wolves: be ye therefore wise as serpents, and harmless as doves". Bible.cc. Jump up^ "Character education: our shared responsibility". Ed.gov. 31 May 2005. Jump up^ knowledgetowisdom.org, Friends of Wisdom "an association of people sympathetic to the idea that academic inquiry should help humanity acquire more wisdom by rational means" founded by Maxwell. Jump up^ Sternberg, R. J. (1985). Implicit theories of intelligence, creativity, and wisdom. Journal of Personality and Social Psychology, 49, 607–62. Jump up^ Brown, S. C., & Greene, J. A. (2006). The Wisdom Development Scale: Translating the conceptual to the concrete. Journal of College Student Development, 47, 1–19. ^ Jump up to:a b c Harter, Andrew C. (2004). "8". In Peterson, Christopher and Seligman, Martin E. P.. Character Strengths and Virtues: A Handbook and Classification. Oxford: Oxford University Press. pp. 181–196.ISBN 0-19-516701-5. ^ Jump up to:a b Orwoll, L.; Perlmutter, M. (1990). R. J. Sternberg, ed. Wisdom: Its nature, origins, and development. New York: Cambridge University Press. pp. 160–177. ISBN 0-521-36718-2. Jump up^ Grossmann, Igor; Jinkyung Na; Michael E W. Varnum; Denise C. Park; Shinobu Kitayama; Richard E. Nisbett (2010). "Reasoning about social conflicts improves into old age". Proceedings of the National Academy of Sciences of the United States of America 107 (16): 7246–7250.doi:10.1073/pnas.1001715107. PMC 2867718. PMID 20368436. Retrieved 1 May 2011. Jump up^ Neurobiology of Wisdom: A Literature Overview. Jump up^ Peterson, Christopher; Seligman, Martin E. P. (2004). Character Strengths and Virtues: A Handbook and Classification. Oxford: Oxford University Press. p. 106. ISBN 0-19-516701-5. Jump up^ Ferrari, Michel (2012). The Scientific Study of Personal Wisdom. Springer Verlag. ISBN 978-9048192304. Jump up^ Vervaeke, John. "The Cognitive Science of Wisdom". Mind Matters Conference. Retrieved 13 April 2013. Jump up^ Sternberg, Robert J. (2003). Wisdom, Intelligence, and Creativity Synthesized. New York: Cambridge University Press. ISBN 0-521-80238-5. Jump up^ Lewis, C.T. and Short, C. (1963). Latin Dictionary. Oxford University Press. ISBN 978-0-19-864201-5. Jump up^ ["About, on Shades of Sentience". Retrieved 7 August 2014. Jump up^ "Bahai Reference Library". Tablets of Bahá’u’lláh Revealed After the Kitáb-i-Aqdas. US Bahá’í Publishing Trust, 1988 pocket-size edition. Retrieved 19 March 2013. Jump up^ Browne, ?Abdu?l-Bahá ; translated by Edward G. (1980). A traveler's narrative. (New and corr. ed.). Wilmette, Ill.: Bahá'i Publ. Trust. p. 46. ISBN 0877431345. Jump up^ Browne, ?Abdu?l-Bahá ; translated by Edward G. (1980). A traveler's narrative. (New and corr. ed.). Wilmette, Ill.: Bahá'i Publ. Trust. ISBN 0877431345. Jump up^ Esslemont, J.E. (2006). Bahá'u'lláh and the new era : an introduction to the Bahá'í faith. Wilmette, Ill.: Bahá'í Pub. Trust. ISBN 1931847274. Jump up^ Wolpe, David, perf. "Re'eh: What it Means to Choose." Rabbi David Wolpe. Sinai Temple, 11 Aug 2012. web. 16 Aug 2013. Look up wisdom in Wiktionary, the free dictionary. Look up -wise in Wiktionary, the free dictionary. Look up sophont in Wiktionary, the free dictionary. Wikimedia Commons has media related to Wisdom.